Yeah, I'll say it: I'm mostly having a good time here. Yes, there are weaknesses and inconsistencies, but this really, really feels like Superman. Of course, he does benefit by comparison with the New 52 version. I feel that one of the reasons I am pretty OK with this so far is that, unlike Nu52 downright erasing the marriage, this is still building upon said marriage. The halves of each issue that have involved the arson subplot, or Lois and Jon, or Clark interacting with other superheroes, have been fairly good. I'm not crazy about Jor-el talking in Bendisspeak and being obsessed with molding his grandchild like Norman Osborn, but Clark and Lois still feel like themselves. 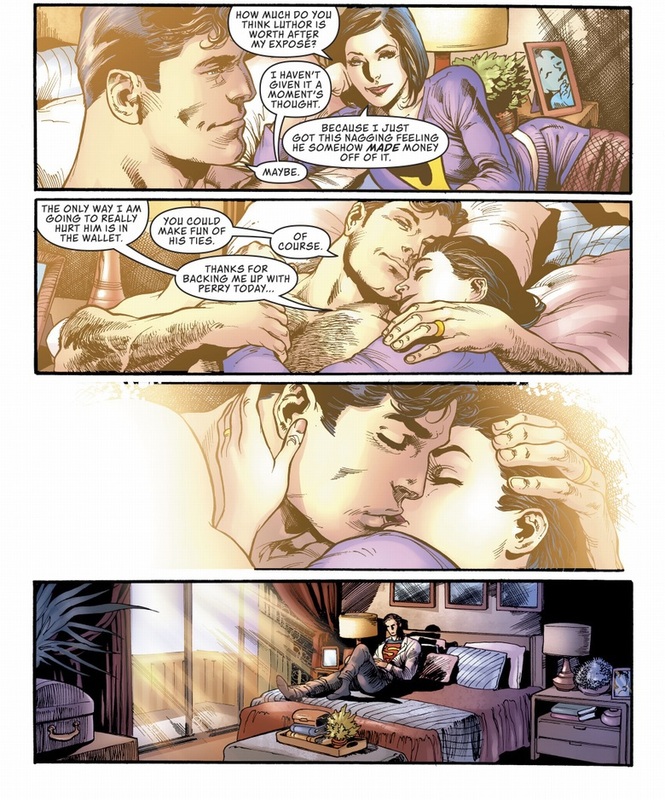 Lois and Clark will always be an awesomely great married couple. I’m sure Clark got many dirt on lex he could spill to Lois. But know she can dig up many more things on lex on her own. 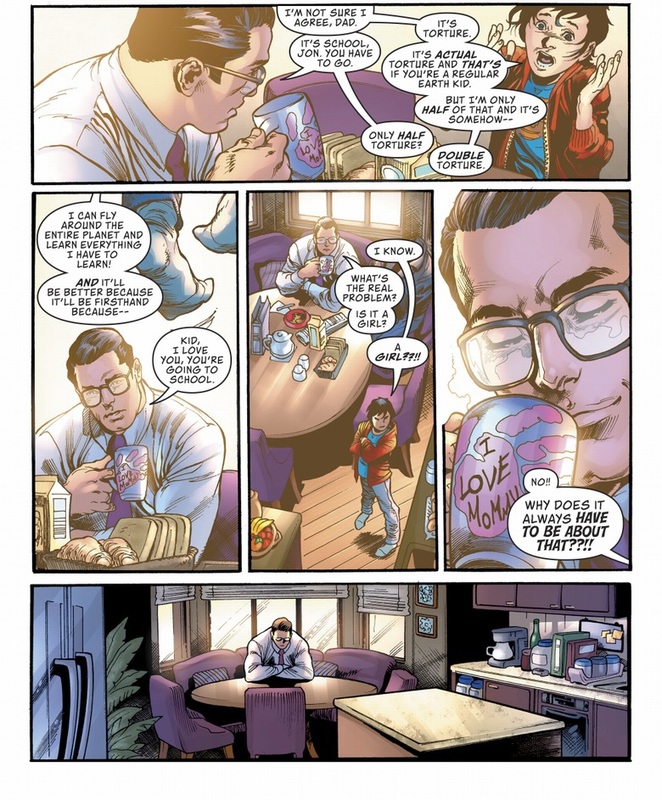 Also like Clark teasing Jon about going to school. "A boy, then? It's okay if it's a boy, You know your mother and I will always love and support you, no matter what." "Dad, I kissed Damian one time! ONE TIME! I was just curious!" It's strange that they'd devote a miniseries to cleaning the slate only to start a new series with a reminder of everything they just got rid of. Bendis has already confirmed on social media he's not getting rid of them and that he has big plans for them down the line. I assumed at the very least Lois would be back soon. It just seems odd to devote a mini to changing the old status quo only to reference it again when the new series starts. If the were going to go that route then why not just put the Man of Steel story in the regular Superman monthlies. At a guess, it's for the people who didn't buy Man of Steel, but do buy Superman, so they know what's going on. I have but one question. Just one. Where the hell did Lois get a Jayna shirt from?